Russia is ready to coordinate practical steps to block the Turkish-Syrian border in cooperation with Damascus, Russian Foreign Minister Sergey Lavrov said Friday after talks with his Syrian counterpart. Lavrov recalled that French President Francois Hollande earlier voiced same proposal. 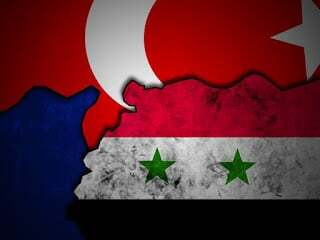 If Russia, Syria, France block the border, many terrorists groups in Syria, such as ISIS and al Nusra, will be cut from the supplies through Turkey. On Saturday, the Syrian army spokesman, Brigadier General Ali Mayhoub, said, the Turkey military fired a number of mortar shells toward Syrian army positions from the Mount Jebel Aqra area, which is on the Turkish side. Apparently, it isn’t an act of support of the idea to block the border. According to Damascus Turkey has also increased weapon, ammunition and equipment shipments into Syria in exchange for oil and antiquities looted by ISIS. The Syrian army and the National Defense Forces (NDF) and Hezbollah seized back the areas of al-Markashileh and Jab al-Ahmar in the Northern parts of Lattakia province on Saturday. The Syrian forces pushed back the militant groups and restored full security to al-Rahmalia and al-Khidr hills. According to the field reportrs, the Syrian Arab Army (SAA), the NDF and Hezbollah backed up by the Russian Air Force launched an advance to capture the strategic town of Quayratayn form the ISIS in the Homs province on Saturday. Now, the pro-government forces took control of the villages of Muntar Armilah and Thaniyah and advancing on Quayratayn. A number of pro-Syrian media outlets said Russia has vowed continued fight against terrorists in Syria using its warships. Moscow will reportedly launch massive operations codenamed ‘Total Destruction’ against the terrorists using 69 Sukhoi fighter jets, Tupolev 160 bombers, submarines and warships deployed in the Mediterranean Sea. The Russian grouping will be supported by S-400 missile defense systems in deployed Syria and the Moskva guided missile cruiser outfitted with S-300F Fort anti-air systems at the coast of Latakia.